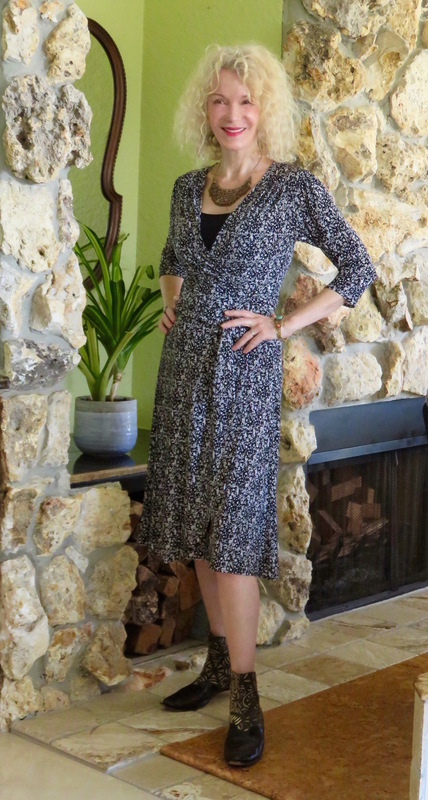 Visible Monday #161: A Wrap Dress Is Always Fitting! Welcome to Visible Monday #161! If you want to participate, it’s so easy: just go to the bottom of this post for the how-to. Please be kind and leave a link to Not Dead Yet Style in your post. A wrap dress is my go-to silhouette when I’m not sure what to wear. A well-fitting wrap, like this Karina Ruby, always feels good, looks polished and goes casual or dressy. I am medium dressy today, but I’ve also worn this dress over jeans and leggings, with oxfords. The colorful jacket is my favorite Trina Turk, purchased on consignment (similar). It always surprises me how many outfits it “goes” with. Booties are Cydwoq, via eBay (sim), the necklace (sim) is thrifted, and the bracelet (sim) is from Bella’s wonderful shop. Holy smokes, I thought I’d missed it for sure! Thank you for hosting, you look gaw-jus (love/want to steal that jacket). Love this wrap dress! You look gorgeous and it shows in your smile! Thanks for sharing your advice! You look funky and comfortable. My two guidelines. Wow, I am in love with that coat! It’s gorgeous! The Karina dresses are very flattering on you, Patti. I hope your week is going well. You look great in your wrap dress, Patti. Layering the colorful jacket over your wrap dress was a brilliant idea. You are more beautiful with every post. Patti! Those boots! They’re so intricate. I’d love to see them close up. Thanks for giving all of us such a great and collaborative link up! You look great in your wrap dress! I have been wanting to try one, but so far, haven’t found one that calls to me. Love those ankle boots, Patti! So unique! And you can’t beat the versatility of a wrap dress. Really cute! Such a pretty dress. Love the pattern! Hi, Patti…you look so pretty in that dress! I hope you’re having fun in NYC! Love this dress on you Patti , you have some lovely dresses best wishes . Lovely dress, thanks for hosting! Wrap dresses are perfection. They are flattering on most people and something that I rely on when I need to get dressed quickly. They always look good. Love yours Patti !! I love wrap dresses. Your outfit just inspired me to wear them with booties this fall! Those booties, Patti!!! And you’re absolutely right, wrap dresses are the best thing next to sliced bread and hugs. A wrap dress is FOREVER! Oooh! I like that necklace! Isn’t it funny that such a bold patterned coat goes with so much? I often find that with my bold prints. You’re in NY right now? : ) Hope you are having a wonderful time! You are looking extra radiant here. Wrap dresses are so flattering. Love those booties! Oh the Ruby is a nice cut .. I’ll have to check that one out. I have an Audrey & a Megan and I’m getting to be a big Karina fan. Thanks for hosting! This is a great wrap dress and the jacket is such a stand out piece! The new look of the blog is wonderful! LOVE that Trina Turk jacket…it is EVERYTHING. That coat is just the best! What amazing colours. I love the boots and the necklace with the dress. Just the right amount of pizzazz! Your dress is lovely and so is your new blog. Perfect fit and I love your shoes too. This wrap dress looks perfect on you! I hear you loud and clear about the wonders of pulling on a wrap dress. I have yet to invest in a Karina one, but it’s on my radar. This style of dress always looks good on you. And I really like how you wear that amazing Trink Turk jacket with it. Thanks for hosting, Patti. I brought dip this time. Lookin’ lovely, my dear. Thank you again for the privilege of meeting you today. I had fun! Lovely dress; you look fabulous in it! I have been searching for a new wrap dress. They are so flattering! You look lovely in this, and I adore the boots! 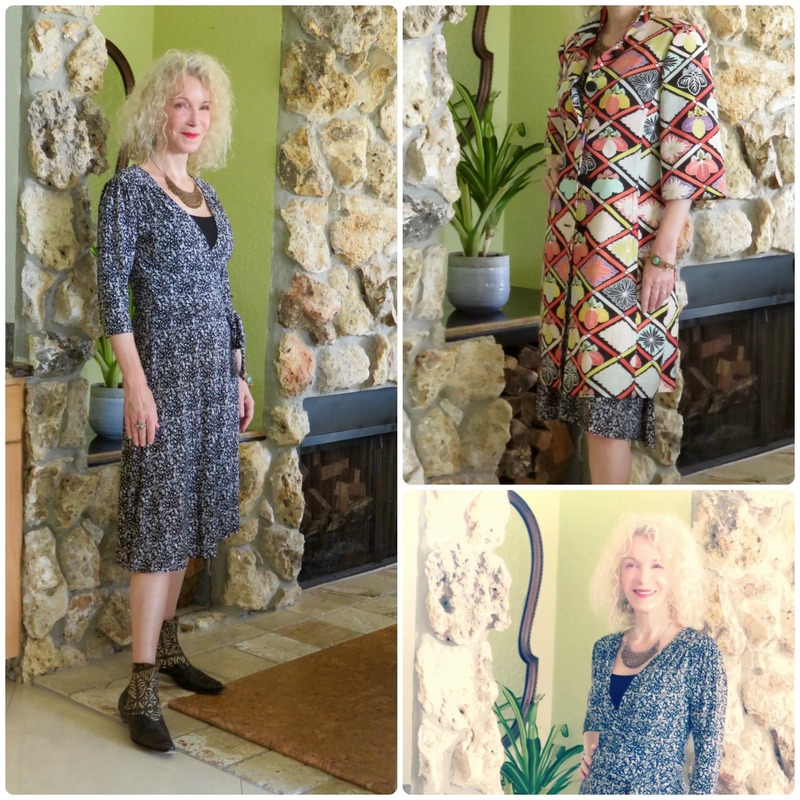 Wrap dresses look good on all women…they are great! Thanks for the link up as always, Patti! Such creative and wonderful print mixing here! I love the whole look, but the booties! Oh, how I adore those booties! You are getting more and more creative every time I see you, Patti. Luv the Cydwoqs with the dress. And that coat! Who would’ve thought, but it does look brilliant together. And I even saw it on you in person!! You always do look amazing in a wrap style dress, Patti. Love the thrifted necklace with it too. Thank you for hosting as always, have a great week! Yay, Patti, I love your new comment system, it’s cool! Your Karina dress is really pretty and the Trina Truck coat is beautiful, not surprised it goes with so much as it is so bright and cheerful! The dress is perfect for this weather too as a great length and you can layer underneath it too! I could just say Ditto Val…I too love the coat, and it goes beautifully with your dress. The Cydwoqs…definitely the hippest boots ever, and we west coasters, Val and I, consider ourselves pretty hip, LOL. I want a pair just so I can say the name over and over! Thanks for hosting VM Patti! Always a pleasure to join in. Wrap dresses are the best! A wrap dress is my go-to option, too, when I need an easy outfit. One-stop dressing at its best. And your dress is very pretty. Have a great week, Patti! Love that coat! What a hot contrast to the cool blue of the dress. And the hippest boots ever! Definitely visible, you are, and an inspiration to the rest of us.